We got a new microscope in yesterday that I had ordered from Amazon. It's normally a $160 microscope and it was one sale for $80 and had free shipping-- here's the link in case you're interested. I've been thinking about buying a microscope for us for a few years so I decided this deal was just too good to pass up. We spent a good 30 minutes looking at all the slides I had ordered to go along with it-- I guess they couldn't wait either! Ian, in particular, was very interested. In no time at all he was switching slides and looking at every single slide in 4x magnification, 10x and then 40x and comparing what he was seeing. He had me look each time and Alec and Evan looked in every now and then too. We talked about cells, cell walls, chloroplast, muscles, and more. 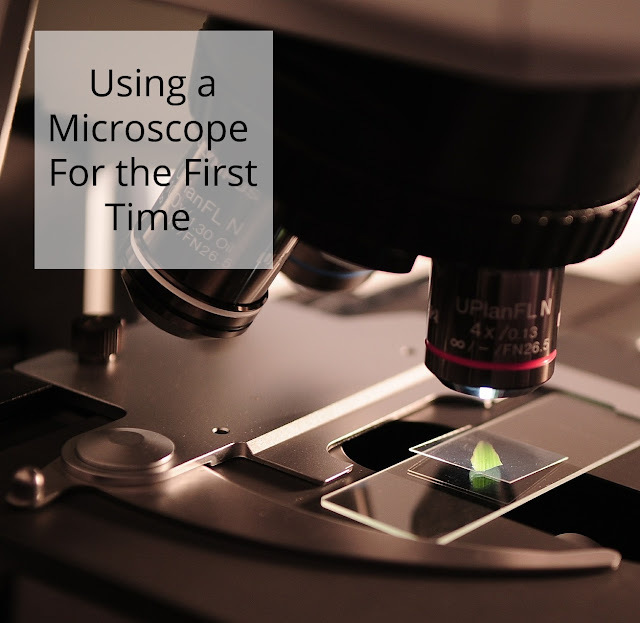 We talked about safely handling the microscope, treating glass slides with care and taking turns without pushing or shoving so no one would accidentally knock over the microscope. I showed the boys how all the buttons and knobs worked, how to bring the slides into focus, and explained why it was important not to touch the lens with our fingers. We talked about the importance of the clips to hold the slide in place and always starting with the shortest, widest lens and then slowly moving up in intensity. I did caution the boys to make sure they had enough room between the slide and the lens when turning so that they didn't accidently break the slide (something I can remember doing myself when I was in school and first introduced to a microscope). They listened really well to all the instructions and asked lots of questions as they went along exploring. They were so good about taking turns too! It was a lot of fun and I know we'll be getting lots of use out of our new microscope. They really enjoyed looking at things through the microscope and I often heard "cool" or "neat" or "oh wow!" I can't wait to go exploring and bring things home to put on our own slides. Between working with our new microscope and working on their science fair projects we had a pretty full day of science learning. I realized this morning that we have a little less than three weeks left before the fair and we need to get moving. We picked up a few more books on each subject at our library and Ian spent some time reading one of his new books. Alec settled down to work on his board.